I have a SQL table with a datetime field. The field in question can be null. I have a query and I want the results sorted ascendingly by the datetime field, however I want rows where the datetime field is null at the end of the list, not at the beginning. Is there a simple way to accomplish that? You didn't specify your DBMS. You can use the built-in function to check for null or not null, as below. I test it and its working fine. 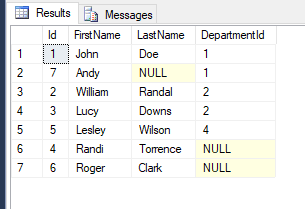 Any non-null number becomes 0, and nulls become 1, which sorts nulls last. These methods avoid the issue of having to come up with or manage a "maximum" value of every type or fix queries if the data type (and the maximum) changes (both issues that other ISNULL solutions suffer). Plus they're much shorter than a CASE. When your order column is numeric (like a rank) you can multiply it by -1 and then order descending. It will keep the order you're expecing but put NULL last. Thanks RedFilter for providing excellent solution to the bugging issue of sorting nullable datetime field. I am using SQL Server database for my project. Changing the datetime null value to '1' does solves the problem of sorting for datetime datatype column. However if we have column with other than datetime datatype then it fails to handle. To handle a varchar column sort, I tried using 'ZZZZZZZ' as I knew the column does not have values beginning with 'Z'. It worked as expected. On the same lines, I used max values +1 for int and other data types to get the sort as expected. This also gave me the results as were required. As mentioned in the answer provided by a_horse_with_no_name. Solution using the "case" is universal, but then do not use the indexes. In my case, I needed performance. Not the answer you're looking for? Browse other questions tagged sql sorting sql-order-by or ask your own question. 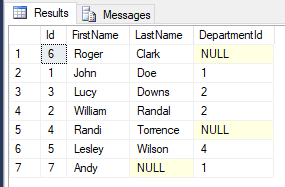 Possible to use SQL to sort by date but put null dates at the back of the results set?